Birthplace : Detroit, Michighan, U.S.
Pat Perles enters his second season with the Chiefs and his first as Kansas City’s assistant offensive line coach. In his new capacity, he will tutor the club’s blocking unit alongside offensive line coach Bill Muir. Perles served as the club’s defensive quality control coach in 2009 and also worked closely with linebackers coach Gary Gibbs. Perles joined the Chiefs after nine seasons in the collegiate ranks. He also owns six years of experience in the Canadian Football League after beginning his pro coaching career with the L.A. Rams. He joined the Chiefs after spending six seasons at North Dakota State (2003-08). He served as offensive coordinator during his final four campaigns. Perles joined the club as offensive line coach and run game coordinator. During his tenure at the school, the Bison posted a 49-17 record. In 2008, Perles oversaw a North Dakota State offensive unit that averaged 29.9 ppg and 384.3 ypg. Under Perles’ direction QB Steve Walker finished his career with 7,033 passing yards and was named the Great West Offensive Player of the Year in 2007. Meanwhile, RB Tyler Roehl finished the 2007 campaign with 1,053 yards, including a school-record 263-yard performance at Minnesota. Perles spent three seasons as the tight ends coach at Michigan State (2000-02) and also served as the club’s co-special teams coach in 2000. He was instrumental in the development of TE Chris Baker, who established school career records for tight ends in receptions (133), receiving yards (1,705) and touchdowns (13). Prior to returning to his collegiate alma mater, Perles spent six seasons with a trio of Canadian Football League teams. He served as the offensive line coach for Hamilton (’98-99). Under his direction, the Tigercats allowed a CFL single-season record 7.0 sacks in ’99. That season, Hamilton registered a 32-19 victory vs. Calgary in the Grey Cup after losing the CFL’s title game the previous season. 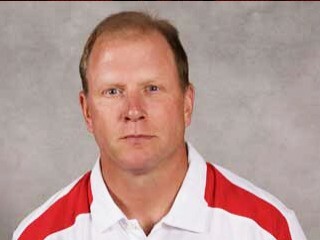 He spent one season as the offensive line coach for Winnipeg (’97) after spending three years in the same capacity with Saskatchewan (’94-96). The Detroit, Michigan native received his initial NFL coaching assignment as a member of Chuck Knox’s staff with the L.A. Rams (’92-93). He began his coaching career as the defensive line coach for the University of Toledo (’89-91). He tutored DT Dan Williams, who was a first-round pick of Denver and later played for the Chiefs. Part of a distinguished football family tree, Perles is the son of George Perles, who served 12 seasons as head coach at Michigan State (’83-94). The younger Perles served as a linebacker for the Spartans. He was a member of Spartans teams that played in the ’84 Cherry Bowl and the ’85 Hall of Fame Bowl. Perles was an all-state selection as a nose guard at Upper St. Clair High School in Pittsburgh, Pennsylvania, the same high school alma mater as Chiefs Head Coach Todd Haley. Perles and Haley both grew up around the great Steelers teams of the ’70s and served as ballboys for the club. Perles’ father was an assistant coach with the Steelers (’72-81), while Haley’s father served as Pittsburgh’s Director of Player Personnel (’71-90). Education: ­Michigan State University (B.S. ’88). Born: Detroit, Michigan. Family: Wife - Karen; Children - Hannah, Joseph and Julia.